They had a few different Yankee Stadium Inaugural Season balls to choose from. I choose one that is dark blue and silver. The dark blue strip says Inaugural Season New York Yankees. The silver strip has the 2009 Yankee Stadium Inaugural Stadium logo and the Yankee baseball and bat logo that has the patriotic top hat on the bat. At Yankee Stadium Mik choose one of the Inaugural Season mini bats. They had them in natural and dark blue. He went with the dark blue colored one. 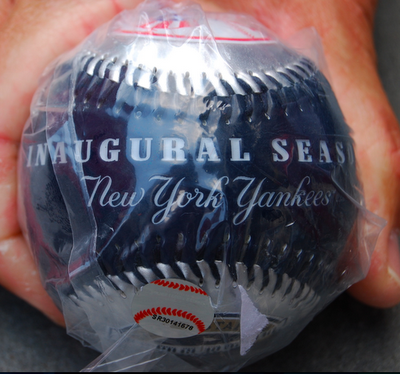 It has the 2009 Inaugural Season logo on it, which features the facade of Yankee Stadium in an oval that says Yankee Stadium Inaugural Season and 2009 in the center. At a travel plaza stop on the I-87 in New York on our way from Toronto to the hotel in New Jersey we found a penny smasher that had a Yankees design. I was not sure if we would find one at the Yankees, so Mik and I got one there. It turns out Yankee Stadium has some machines, but we did not spot them and they are also $1.01 per penny compared to what used to be the norm of $0.51 per penny. Mik also got a We Will Always Remember Twin Towers penny.